The worst thing you can do when you want to loose weight is what? NOT EAT BREAKFAST! I have always been someone who did not eat breakfast. I think it started somewhere in High School when I thought it was an easy meal to skip, save myself some calories. "Hey, who has time to eat breakfast"? Well, I am about to turn 34 and my metabolism is not what it used to be -Not that I was ever super skinny or tiny, except before I hit puberty. It is harder to loose weight; therefore, I have had to make some changes. The biggest change I have made is to eat breakfast within 1-2 hours of waking up. Even if it is something small, like a spoon full of almond butter, just put something in your stomach. Preferably a protein source such as an egg and a complex carbohydrate such as whole wheat toast. I don't know how factual this information is, but it is all over the internet. Sumo wrestlers skip breakfast in order to slow down their metabolism and cause the body to hold on to fat. 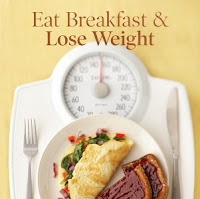 When we skip breakfast, the body does the opposite of what we think it will do; it makes us fatter. Our body says, "Wait! We're starving. Save the fat stores!". Same rule applies for "diets". When we do not fuel our bodies, our bodies think it is starving and it will slow the metabolism and we hold on to our fat stores. This is why diets do not work long term. You need to eat every 2-3 hours to keep fueling your metabolism. Now, by eating every 2-3 hours, I mean making good food choices, not having a snickers bar all day long. So, eat breakfast within 1-2 hours of waking up (1 hour being ideal) if you want to jump-start your metabolism. Check out the following ideas for breakfast. 1/2 cup Cottage Cheese with fresh strawberries, mango, or blueberries, topped with 1 Tbsp flax seed meal and 1 tsp stevia sweetener. Boiled Egg with an orange. 1/2 cup quinoa (i make mine and freeze it into portions, thaw in microwave for 30-60 seconds) for a powerhouse breakfast that will fuel you through your workout! Or, if your lucky enough to have a bag of Shakeology, you can make one of these delicious recipes. 1 Scoop Chocolate Shakeology, 1 Cup water, 1/3 almonds soaked for a few hours in water, 2 tbsp PB2(a lower calorie dried peanut butter) and ice. I also like to make my shakes really thick, almost like ice cream and then eat it with a spoon! OH SO GOOD! Need help learning more about nutrition? Join my next 10 day nutrition group for help with serving sizes, food combinations, how to maximize fat burning by increasing your metabolism, and daily support in a private Facebook group. You even get a MEAL PLAN with lots of different options. This recipe actually came from our clean eating meal plan. Click the link to sign up, or message me, Jennifer Wood via email or Facebook.